Over time your bike can start to look a little old and tired, it’s probably picked up a few scrapes and the paintwork isn’t what it used to be – but the bikes still as good as ever! You might be part of a cycling club or a race team looking for livery and specific colours to be added to your frames, or you may just fancy being a little bit different and owning your very own custom painted bike like some of the Pro’s. Whatever your requirement, I can apply my custom paint techniques and design skills to provide a high quality cycle frame painting service for any frame and forks. This can be as simple as a single colour respray, a restoration project on an old steel frame bike or a full custom design for the latest carbon fibre road frame. I can also help advise on your design and colour choices and will provide design concepts for paint schemes based on the type of frame you have and the style of riding you do. Paintwork can be applied to steel, aluminium, alloy and even carbon fibre frames. 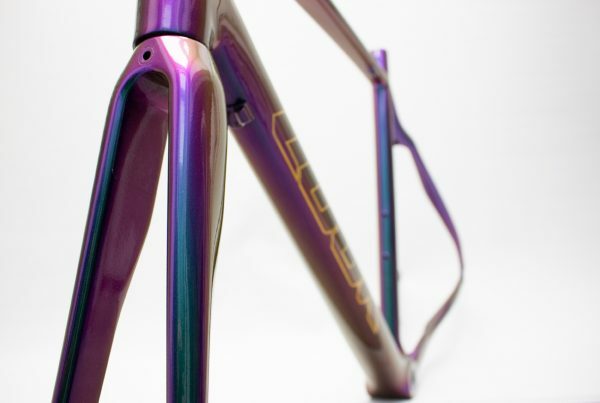 Special effect paints are available such as metal flake, pearls, metallics, flip-flops (chameleon) etc, there really are no limits to the effects that can be achieved for your custom painted bike frame. 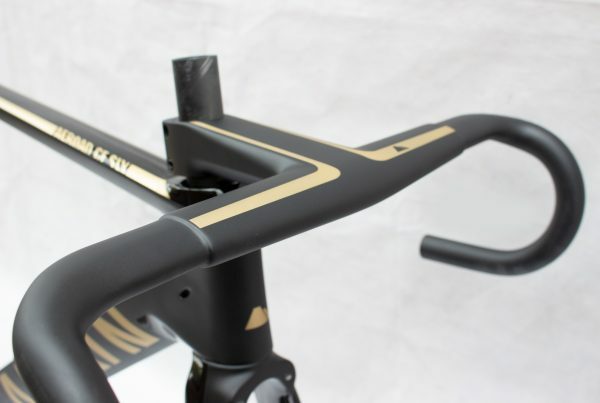 You are not limited to just having your frame and forks painted, I can customise almost any cycling component or accessory, including your stem, handle-bar, seat post, crank arms and other smaller items. I can also match your helmet, shoes and sunglasses! Below is a rough idea to the process involved when your cycle frame is being painted. After an initial consultation email/chat and a formal agreement on the cost of your project we will establish an estimated time-frame and then I’ll be able to provide visual concepts of your paintwork – deposit required. Once the design is agreed and closer to your booking date, your frame can be sent directly or dropped off. It should should be stripped of all components and be clean and in good condition. The frame will then be prepared for its new paint job with the correct paint removing method. 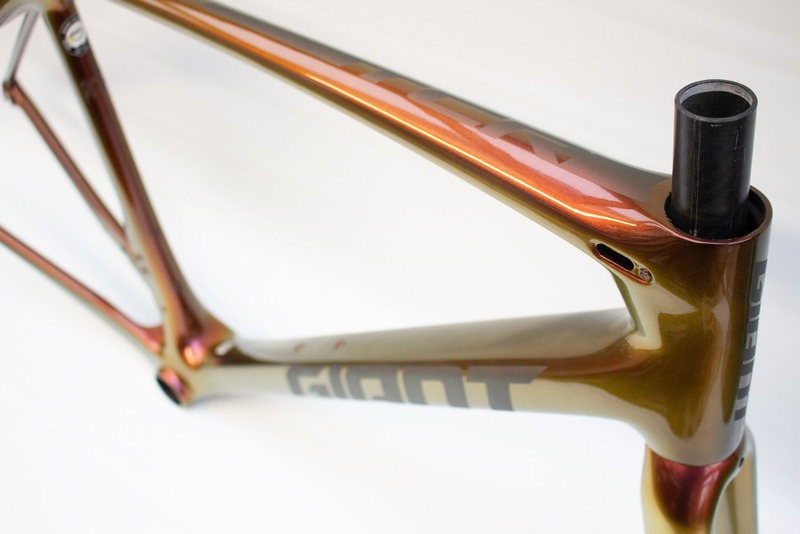 With all carbon frames the original finish is removed by hand, no blasting or power tools are ever used! There are two levels of prep for paintwork on carbon, ‘Advanced Prep Level‘ which is taking the frame down to its raw state. This is labour intensive, it adds the least amount of weight/paint back on the frame and best suited to having a naked carbon finish or for super-light paintwork. The ‘Standard Prep Level‘ is less labour intense and more cost effective, it’s better suited if going with full colour paintwork and requires sanding back the original finish to create a uniform surface ready for priming and building colours on top. Alloy and steel frames are usually media blasted before paintwork and can be either powder coated or wet sprayed. Once a frame is in a raw state it’s then epoxy primed ready for paint. 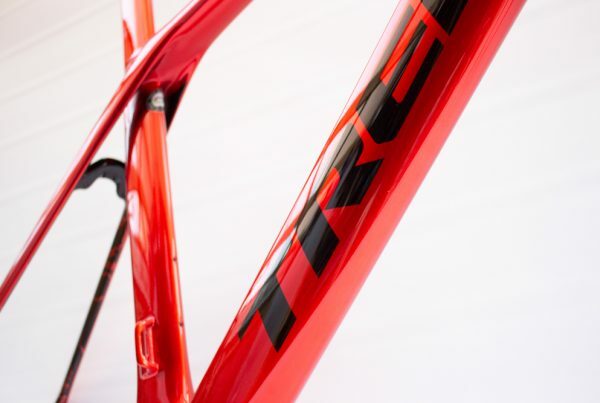 After the correct primer coat has been applied, the approved design of your bike is then carefully recreated on your frame, applying all layers of colour paint along with any artwork, special effect, graphics or decals you require. I try to avoid using vinyl graphics or stickers where possible and prefer to apply any graphics as an actual layer of paint so that it will be under a protective clear coat to provide the best possible smooth finish for your frame. The majority of decals and graphics are created with a digitally cut stencil to recreate accurate logos and graphics. Please note – I don’t paint Fluro. It’s a light-fast paint (fades) and has poor coverage. The final stage of any paintwork is clear coating. I use premium quality automotive grade high-solid (HS) UV protective clears to protect your frame from the elements and ensure your paint job is as deep and glossy as it can be. I offer three different types of finishes for you to choose from, including a High-Gloss wet looking clear, a Satin finish and a total Matte finish. It is possible to use a combination of finishes such as on stealth paintwork to achieve a totally unique and stunning look. Prices vary depending on paint effects, complexity of graphics, design/decals required and frame type. Generally steel, alloy and aluminium frames are cheaper to paint due to their different preparation treatment. For more information or to start the process of having your bike painted, get in touch with an outline of your requirements and receive a competitive quote. Prices reflect the work and materials needed to produce the best results and I’m confident you will find them very competitive compared to other bespoke bike frame painters offering the same level of service as I do. If you require your bike to be stripped down (of components) or re-assembled prior to or after paintwork this can be accommodated. I have a good working relationship with a number of local contacts including Cytech Level 2 Mobile Cycle Mechanics and very reputable/high-end bike shops available to carry out any advanced work required such as bottom bracket installations, facing, indexing and any other addition to strip downs. Ideally if you can do this locally before sending the frame for paintwork then this is preferred. Additional costs apply, please ask when enquiring about paintwork. This will start with an email or quote request to let me know what you want painting and other details, I will then get back to you with a price and estimated time slot. If you are happy with the price and would like to book in for paintwork, a deposit will be required to add you to the paint queue. Once your deposit has been paid I can then work on some visuals for your paintwork. You might not hear from me for a few months between finalising your design and sending or dropping off your frame for paintwork. This is pretty standard and allows me to focus on paintwork and other customers frames. Closer to the date of your booking I will get in touch to arrange shipping/drop off. Once it arrives it will be inspected and then join the paint queue ready to be transformed. Taking bookings for 2019 with completion times of 2-3 weeks. If you experience any issues with this form or if you prefer to email us direct feel free to do so. If you would like to add any pictures of your bike or parts along with any reference images of what you would like or what’s inspiring your paint work please email them as the form only supports one image at a time.